As many of us welcomed in the New Year with a family dinner, a team from one of Bradford’s top restaurants headed to a local homeless shelter to serve up dinner in style. Staff from Aakash restaurant visited the Edmund Street homeless shelter with bags of food ready to be prepared for hundreds of hungry visitors. With more than one hundred dishes served, and a similar amount frozen for use on a later day, the event was a huge success as day shelter manager, Magda Dziurkowska explained. 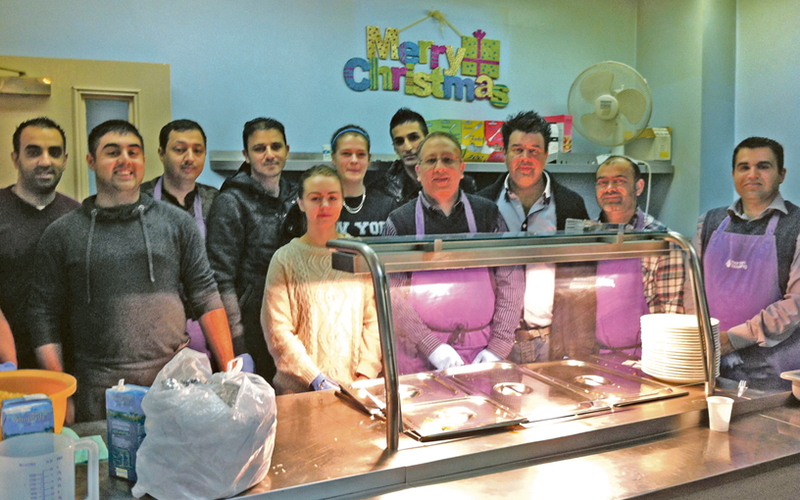 “On New Year’s Day, to be able to welcome around 15 volunteers from Aakash restaurant, all with their own food for serving was amazing,” she said. “A lot of people who use our services will never have had the chance to visit a restaurant so for the team to be able to bring their amazing food to the shelter was really appreciated. Magda Dziurkowska has been Day Shelter Manager at Edmund Street Shelter, where food, advice and medical consultations are all available for people who are struggling in society. The New Year event proved to be a welcomed experience for volunteers and clients alike as the Bradford community once again pulled together for a pioneering initiative. Azhar Mahmood, restaurant manager at Aakash, now hopes to get more eateries across the city involved with working alongside shelters to ensure everybody has access to a warm, quality meal all year round. He said: “Over the course of 2013 we watched on as government cuts affected families across the country, driving more and more people into poverty with many struggling to even have access to food. “We want to ensure that 2014 is different and the event on New Year’s Day is hopefully just the first of many whereby restaurateurs across Bradford take responsibility to ensure nobody goes hungry this year. “There are a lot more than 300 restaurants in the city so if we could all come together and just take it in turns to give food to the shelter then it would mean hundreds of people’s lives could be helped. If any restaurateurs would like to speak with Azhar in regard to hosting a similar initiative, please phone Aakash Restaurant on 01274 878 866.